After a week of conflicting media reports, Hong Kong telecoms firm PCCW looks set to make a £2bn takeover offer for cash-strapped Cable & Wireless. On Monday PCCW shares were suspended on the Hong Kong stock exchange pending an announcement about C&W and also Japan Telecom, Japan's third biggest fixed-line operator. Last week, PCCW confused investors by telling the UK authorities that it was interested in C&W, while giving a contradictory story to Hong Kong regulators. Now, PCCW chairman Richard Li has told the Sunday Times newspaper that, while he is not planning a hostile bid, the two firms are seeking ways to work together. Over the weekend, Japanese newspaper Asahi Shimbun reported PCCW might make a bid for Japan Telecom, which is controlled by Britain's Vodafone. According to PCCW, it approached C&W in December, but was rebuffed. The two companies are closely linked. 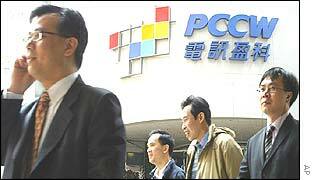 PCCW, a highly fashionable firm during the internet boom of the 1990s, leapt into the big league when it bought C&W's Hong Kong Telecom subsidiary in 1999. As a result, C&W owns 14% of PCCW. But while C&W shareholders may see a deal as a way of resolving the firm's delicate financial condition, PCCW shareholders have reacted with dismay to the rumours of a deal. The Hong Kong firm is saddled with debts of US$4.2bn, and has previously promised to focus on paying that off, rather than making fresh acquisitions.